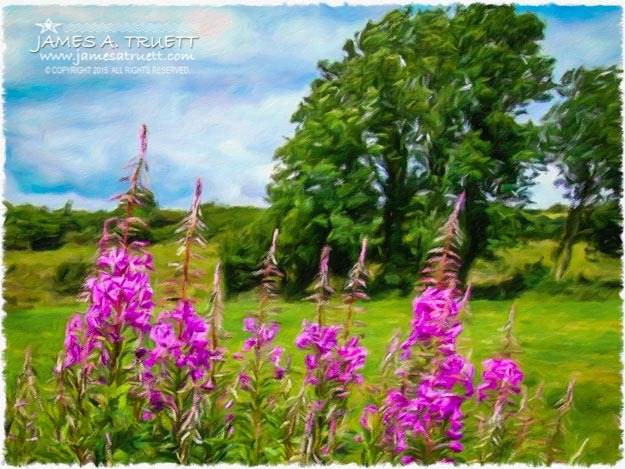 Blooming fireweeds reach for the sky in a lush green meadow in the County Clare, Ireland, Townland of Lanna between Lissycasey and Ballynacally in this artistic interpretation of one of my original images. This brightly colored perennial is found throughout the Irish countryside from June to September. By Fall, when they go to seed, the plants have distinctive cotton-like plumes for spreading the seeds to the wind. Prior to 1930, the wildflower was found in Ireland only in a few spots primarily in the North. It has since spread throughout the country, brightening bogs, hillsides and country roads during the summer months. The Townland of Lanna, the scene for this artwork, is part of the Parish of Clondegad in the Barony of Islands, is dotted with farms, mostly raising livestock. Baronies date back to just after the Norman invasions of the late 11th Century, when they were established for administrative, judicial and, of course, tax collecting purposes.